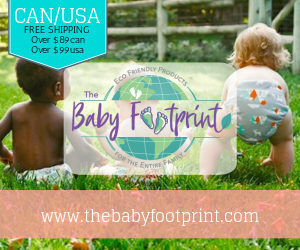 I’ll admit that my experience with bumGenius diapers is extremely limited, but when they came out with this print called “Strong” in support of Post Partum Depression Awareness, I knew I had to give this brand a try. 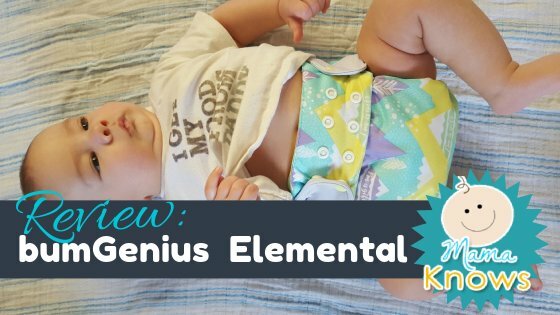 I purchased a bumGenius Elemental 3.0 from Lagoonbaby.com in January, and have been putting it through its paces since receiving it. This is an all in one diaper, meaning there are no pieces to remove and stuffing is unnecessary. 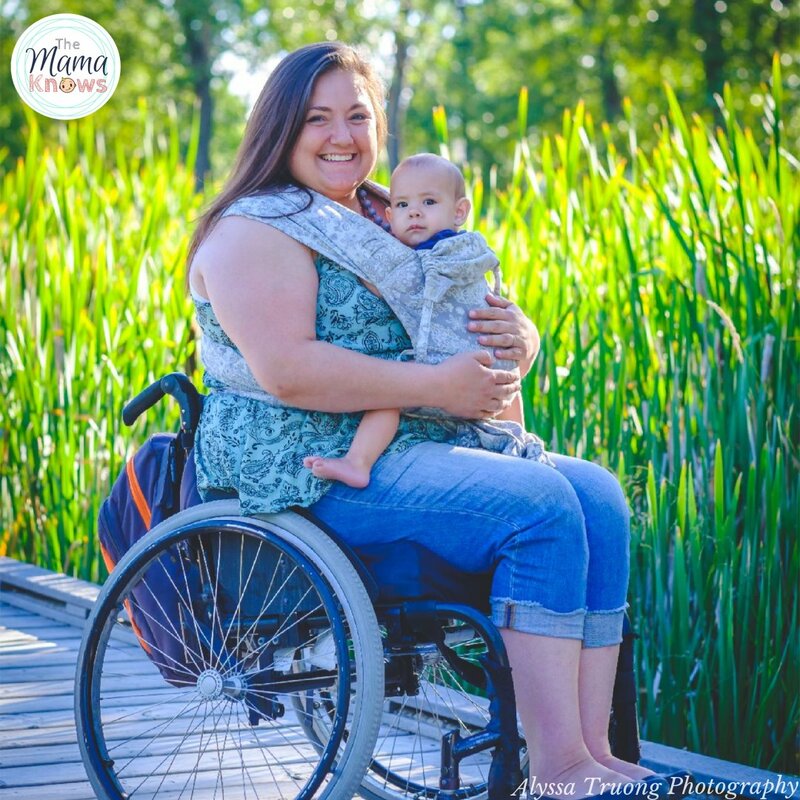 These are the types of diapers that my husband and caregivers typically prefer because they are very easy to use. Being that everything is sewn in though, drying time can be longer than with other detached types. Having the Elemental’s soaker only attached at the front and back helps with drying time substantially. The Elemental 3.0 has one attached soaker, consisting of 3 layers of organic cotton, and 2 layers of organic cotton lining the PUL outer shell. This is a “New” Elemental, which means it’s a little different than the previous versions. Since I am unfamiliar with previous versions, I had to look this up. Apparently, the 1.0 was also lined but had 2 attached soakers, and the 2.0 had the 2 soakers but didn’t have a lining along the inside of the shell. 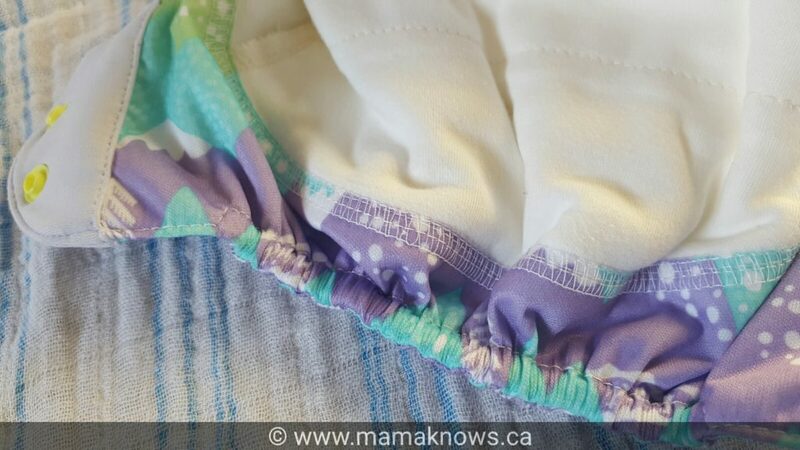 These tabs are not your ordinary cloth diaper tabs! The tabs on this diaper are worth mentioning. I quite like the stretchy material that they use, which is only on the tabs alone. It allows for a snug but flexible fit. There are two rows of waist snaps, which I love, because it means I can adjust the waist and thighs differently if needed. 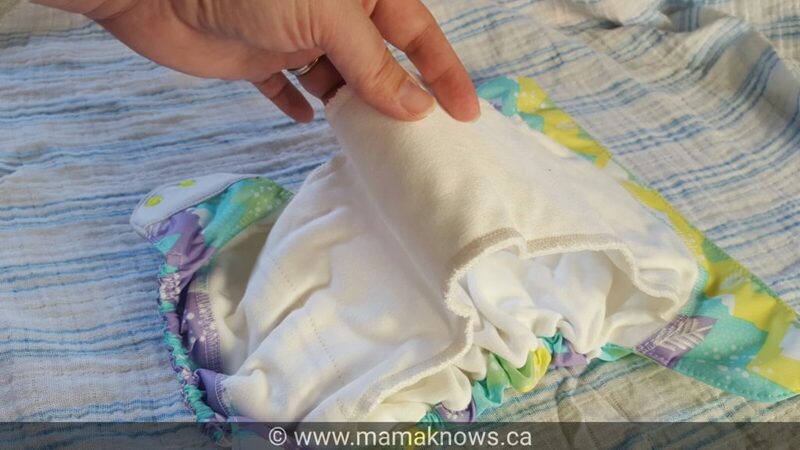 There are no crossover snaps on this diaper, so you won’t be able to do my nifty seal-it-like-a-disposable trick, nor can you adjust it smaller than the snaps on the waistband allow, like you might do for a newborn. The materials used feel high quality and the stitching looks secure. I love the encased rear elastic! The organic cotton is very soft and thick. There are two layers of it making up the liner, and three additional layers making up the attached oversized soaker. The stiching is neat and secure and the PUL is also quite thick and feels high-quality to the touch. There are no tummy band elastics, but there are elastics at the rear and interior elastics on the legs. There are two rows of three rise snaps, giving 3 size options. This diaper is marketed as One Size and fitting 8 to 35lbs. I did not try this at the newborn stage but visually comparing it to solutions that we did use, it does appear to be too big for that initial few weeks. Now at 3 months old and 13 lbs, Littlest fits fine on the smallest setting. I can see the generous width of this diaper means that he will definitely fit in it until potty training. This one does feel a bit bulky at only 3 months, but it is still quite trim as far as one size diapers go. I can easily fit it under all Littlest’s clothes. The single leg elastics are not in their own external casing and so the liner and PUL meet together, without that as a barrier. Despite this fact, the two times Littlest has pooped in it so far (runny, messy EBF poop), no mess leaked out. The poo was definitely right up to the PUL so I think that any prolonged wearing could possibly leak a bit onto clothing. The Blueberry Simplex All in One has the same style of interior, uncased, leg elastics, as the Elemental – in case you need a comparison. 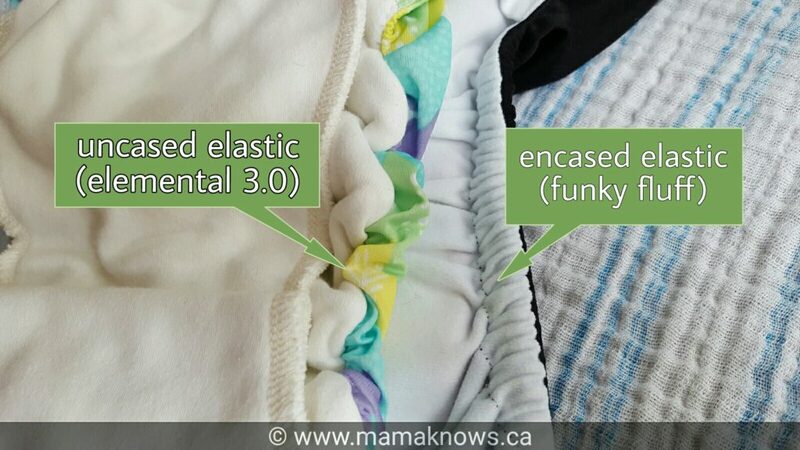 Funky Fluff diapers uses encased elastics, for a contrast comparison. I have included a picture to illustrate the difference. 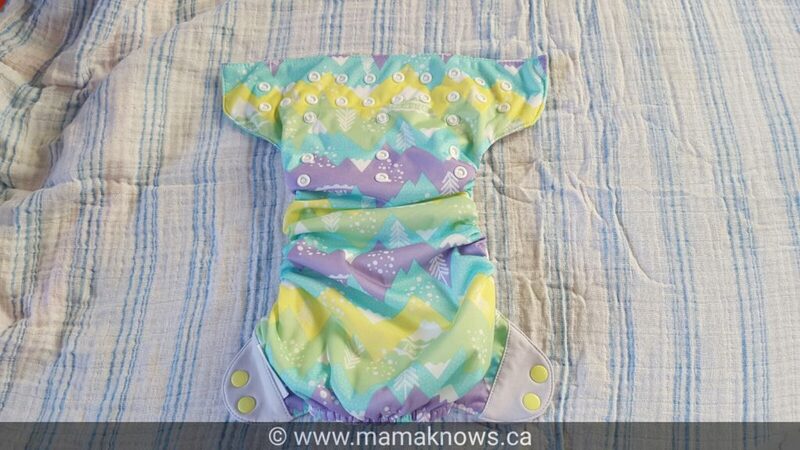 The attached soaker can be folded to different wetzones depending on whether you have a boy or girl. 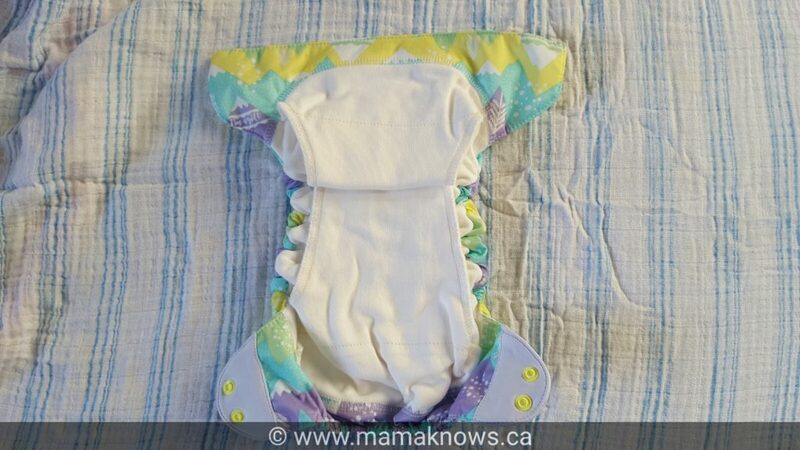 It also can be folded a lot or a little depending on what rise you have the diaper set on. Check out this short video to see what I mean. It’s no secret that my youngest is a much heavier wetter than his older brother. Even as a newborn, he was peeing straight through tricks that worked my previous cloth kid at the toddler stage. So when I saw how thin the soaker is in the Elemental, I was quite skeptical. But I must admit, this diaper won me over. 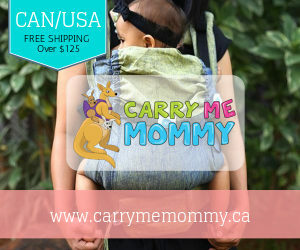 We have put it through many tests: the nap test, the carseat test, the exersaucer test and, most frequently, the Babywearing test. All of these situations are ones where a diaper is truly tested- both by time and by compression. Happy to say, the Elemental 3.0 has failed none. We have not used this diaper for overnight, because I could see after the (3hour) nap test that it wouldn’t have made it longer without boosters. And I felt that adding boosters for the purpose of this particular review wouldn’t be right. Afterall, I’m reviewing this diaper as a stand alone product. But that being said, with the quality of this PUL I’m pretty confident that with appropriate boosters added, it could likely work for us overnight. I really like this diaper and I find myself reaching for it often. It is working well for us. 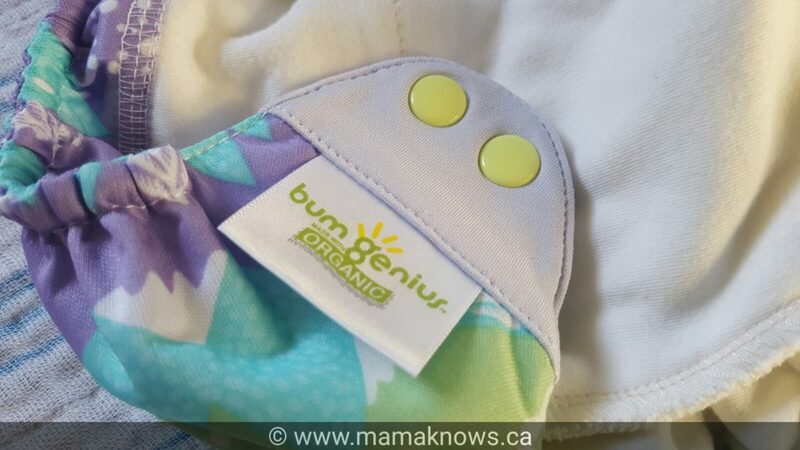 I love the colours and prints that bumGenius offers and the ever important cuteness factor is definitley met with this product. The tabs are kind of amazing, and I’ve learned these are a standard feature on all bumGenius diapers. I also love the fact that there is a centre column for the rise snaps, instead of just two outside snaps. I feel that this is important in a one size diaper. My husband likes this diaper. He is most comfortable with all in one and all in two designs, and says that the Elemental 3.0 works well for him. 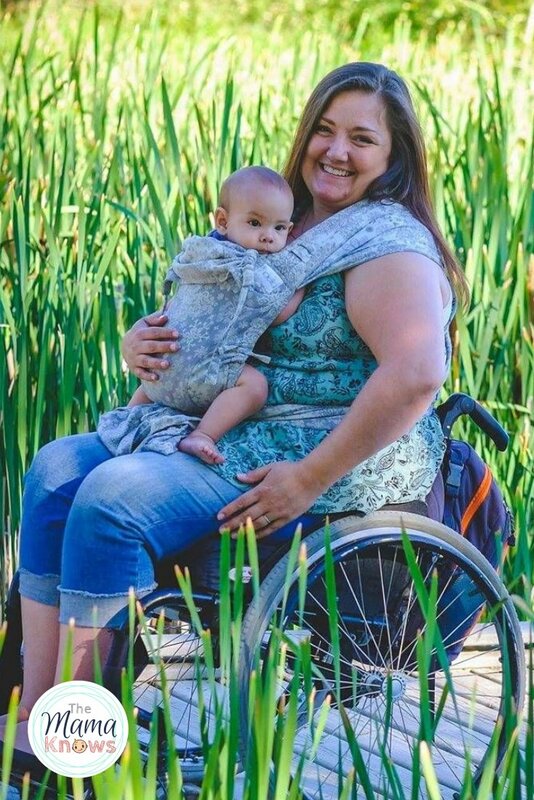 I always ask myself “if this were the only type of diaper in my stash, could I be happy?” – and I think that for us, this might not be the answer to that question. I am less pleased with the design decision to have no seperate casing around the leg elastics, and think it’s an unnessesary risk for leaks. I wish the leg elastics were just like the rear elastic, which is awesome. That being said, the good far outweighs the bad here. This is a solid performer and will remain a permanent part of my (huge) stash, and because the prints are so cute I expect I will want more. I also will have no problem recommending this to others, especially those who are looking for a great All in One option, and would consider buying it as a gift for my mom friends. i love this diaper, especially the strong print. know any retailers that still have this style? Lagoonbaby.com still has lots of “Strong” in stock in the new Elemental design. 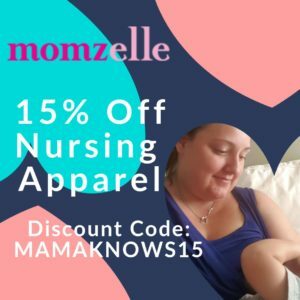 Feel free to use my affiliate link! I have not tried this particular style of Bum Genius yet. I have a different version that I was skeptical of because it was all MF, but it has done well. The one Flip cover we have actually fits my LO the best when at first I did not like the feel/weight of the PUL. The stretchy bands on the BG products is really nice I agree.